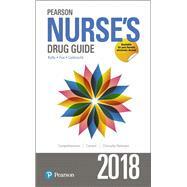 Pearson Nurse’s Drug Guide 2018 is ideal for courses in nursing curricula covering drugs and/or drug administration. It also serves as a useful reference for nursing professionals. The information nurses need for safe, effective drug administration in any setting. With over 400 updates, the new 2018 edition of the Pearson Nurse’s Drug Guide provides safe, effective, current, and accurate drug information in a quickly accessible format. Comprehensive and complete, it lists all drugs alphabetically by generic names for quick reference, with an index listing both generic and trade names. It presents important clinical information for hundreds of drugs, with adverse reactions, interactions, side effects, and impacts on lab results. This new edition includes 14 monographs for new drugs recently approved by the Food and Drug Administration (FDA), and over 400 updates to drug indications, available dosage forms, adverse effects, dosages, and more. IV administration information has been updated regarding adults as well as children. There are subheadings for IV preparation and administration of IV medications for children (when available), which add to the ease of locating appropriate information by age. Kelly M. Shields is currently Assistant Dean and Associate Professor of Pharmacy Practice at Ohio Northern University’s Raabe College of Pharmacy. She holds a Doctor of Pharmacy from Butler University and completed a fellowship in Natural Product Information and Research at University of Missouri-Kansas City. She has practiced pharmacy in retail, community, and academic settings and has worked as a freelance medical writer. Kami L Fox is the Director/Chair and Associate Professor of the Department of Nursing at Ohio Northern University. She holds a BS and MS in Nursing from Wright State University in Dayton, Ohio, and a DNP from the University of Toledo. She is a certified pediatric nurse practitioner in primary care. Christina M. Liebrecht is Assistant Professor of Nursing at Ohio Northern University. She holds a BS in Nursing from University of Toledo, an MS in Nursing from Walden University, and PhD in Nursing Practice from the University of Toledo. She has been in nursing education for the last 18 years with a focus on medical surgical nursing, fundamentals of nursing, and community health nursing as well as the use of simulation to support student learning and safe practice. She continues to practice as a medical surgical nurse in the acute care setting.